The problem I think is, that I had to resize (down) the reverse-shots when doing the compilation. Maybe that distorts the images. Any ideas about that? If you're looking for vignetting or barrel/pincushion distortion, then resizing to show the whole frame is fine. But if you're interested in sharpness, then resizing should be avoided if at all possible because it's very likely to soften the image (or in rare cases to sharpen it). I usually put each image as a separate layer of a single file, tweak their position if necessary to get exact alignment, then crop the whole file. That gives me a bunch of crops all exactly the same. Then I expand the canvas and move the layers sideways so they all show at the same time. I will try out this method! Yes, that was the reason I wanted to do the test. If you have good links to share, which can be useful for doing lens tests et cetera I would appreciate it a lot. A very cursory look at the site referenced appears to have no provisions for "pupillary magnification factor" (the difference in size between the entrance and exit pupils) which can have a significant effect on certain calculations. Although many of the lenses we use for "macro" and 'micro" work are symmetrical (P=1), that is certainly not always the case. Thanks, I've added that article to my personal collection of links. Forsell's article strikes me as a good attempt at balancing theory and measurement. I like his use of the "zero extension magnification" as a tool for simplifying some of the equations. I have a serious concern with the formulas listed by Forsell in that they systematically ignore separation between the principal planes. Sometimes this is OK, sometimes it's not, and there's no way to know which is which except by measurement. As an example, my Canon 100 mm f/2.8 IS USM lens at closest setting of the focus ring and no added extension gives magnification 1.029, while adding 66.94 mm of extension takes it to 1.932. From these, we can accurately calculate that at this focus setting the lens has a focal length of (66.94 - 0) / (1.932 - 1.029) = 74.1 mm. At infinity focus, the corresponding calculation is (66.94 - 0) / (0.6657 - 0) = 100.5mm, consistent with the lens designation. Now let me illustrate my comment that sometimes it's OK to ignore separation between principal planes and sometimes it's not. In section 8b, Forsell gives the formula F = D/(1/M+M+2) as a way of calculating focal length given the magnification M and distance D between subject and sensor. That's equivalent to the formula I gave earlier, with separation omitted. Still, using the simplified formula with my lens and my measurements of M=1.029 and D = 298 mm gives a calculated result of 74.5 mm. This is about 0.5% accuracy, which seems great. In section 5, Forsell gives the resultant focal length of a stacked lens system as Ftot = (Fp*Fr)/(Fp+Fr). 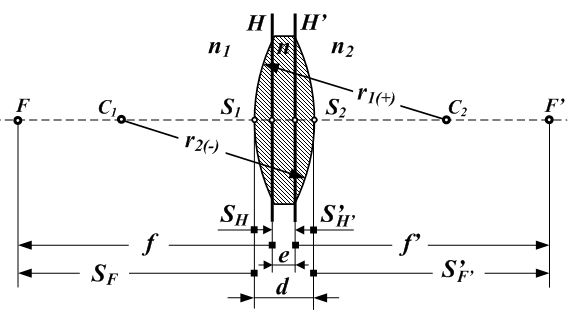 The more accurate formula is Ftot = (Fp*Fr)/(Fp+Fr-d), where d is the separation between corresponding principal planes of front and back lenses. Forsell gives an example using certain lenses where his simplified formulas give the right result to within a few percent. But I have different lenses. Now, what happens when I add 66.94 mm of extension? According to Forsell's formulas, the focal length of the combo should be (55*100)/(55+100) = 35.48 mm, so the 66.94 mm of extension should increase the magnification to (1.83*35.48+66.94)/35.48 = 3.72. However, when I actually extend the combo and take the picture, the measured magnification increases only to 2.15, not 3.72. The discrepancy is not due to slight errors in the lens specs or in my physical measurements. Instead, it's because Forsell's formula is too simple to be correct in this case. The principal planes are buried deep inside these lenses, so that in the physical stack they are quite far apart. Instead of having a resultant focal length of 35.48 mm, the combo actually has a resultant focal length of 206.5 mm. If you're surprised and confused that this is longer than either lens alone, then I sympathize, but that's just the way lenses work. Use the simplified formulas at your own peril. I am both surprised, and a little bit confused. Could you post the calculations for the 100mm and 55mm with the separation of the principle planes if you have it? Also, how would one go about figuring out the separation of the principle planes? I understand you did already state the easy way for finding the combo's focal length using easy measurements, but I am still a bit interested. I'll do a full description as a separate thread. It will probably take some days to put together a good explanation and illustrations. When the Canon 100mm is focused at infinity, its front principal plane is about 80 mm inside the lens. The corresponding principal plane of the reversed 55 is about 30 mm inside that lens, and the mechanical couplings add another 10 mm or so. Using those numbers, the total separation would be 80+30+10 = 120 mm. Then the calculation would be (55*100)/(100+55-120) = 157 mm. 157 mm seems to be quite a ways from 206.5, and indeed it is, but that's because the resultant focal length is quite sensitive to the separation when the separation is large. Back-calculating, the separation needed to give 206.5 is 128.3; that is, (55*100)/(100+55-128.37) = 206.5. Note that 128.37 is not far from the 120 that resulted from my rough "about" measurements. As a practical matter, what this means is that even using a different combination of step rings to couple the two lenses will cause a significant change in the behavior of the stacked combo. Adding to the complexity, it turns out that as the Canon 100 changes focus, not only does its focal length change but also the principal planes move around quite a bit. When the ring is at infinity focus, the "front" principal plane is actually near the back of the lens while the "rear" principal plane is near the front. As the ring is turned, the "front" plane moves forward and at this moment I'm not sure what the rear plane does. In any case, when the ring is at closest focus, the two planes end up pretty near the same place, which is why Forsell's formula fortuitously happens to give the right answer for focal length calculated by magnification and total distance subject-to-sensor. I speculate that Forsell's lens does something similar, so that with his lenses and couplings and the focus ring setting he used, it happened that the relevant principal planes ended up being close together in the configuration that he tested. This unfortunately resulted in giving the appearance of validating his simplified formulas, even though in other cases they don't work well at all. Also, how would one go about figuring out the separation of the principle planes? Reconsidering my to-do list, I think the delay will be longer. So here's a brief description that may get you going. First, be aware that "separation of the principal planes" means different things in different contexts. In the formula that sensor-to-subject distance = FL*(1+mag) + FL*(1+1/mag) + separation, the separation is between front and rear principal planes of the entire optical system forming the image. But in the formula that Ftot = (Fp*Fr)/(Fp+Fr-d), d is the separation between rear principal plane of the front lens and front principal plane of the rear lens. To find the principal planes of an individual lens, one method goes like this. First, measure the change of magnification due to change of extension. From those, compute the focal length. Then let the lens form a focused image of a far-away object ("infinity"). The corresponding principal plane is located one focal length away from the focused image. If you're lucky, you can do this with the lens in both orientations (normal and reversed) and then you know both principal planes. If you can only focus a far-away object in one orientation, then instead set up the lens to focus a close object, measure the magnification, and locate the principal planes at (1+magnification) focal lengths away from the focused image and (1+1/magnification) focal lengths away from the subject. Once you know the principal planes of each lens, you can compute the combo based on those, using the formulas for Compound Lenses in Wikipedia Lens (optics). Thanks for the explanations. I can see how such a small difference in the principle planes between the two lenses can cause such a large shift. I am afraid I follow up until "one focal length away". I am not sure what that means, or if I have missed upon a reference to it. If you hand me a lens, then at the beginning I don't know the location of H' and I don't know the value of f'. If the lens will form a real image at all, then I can accurately measure the value of f' by adding a known extension and measuring what happens to the magnification. If the lens will focus at infinity, then I can easily find F' because that's where an object at infinity forms a focused image. Once I know the location of F' and the value of f', then H' is located at F' - f', in other words, "one focal length away". If the lens will not focus at infinity, but will focus at some shorter distance, then I use the same trick but with a slight modification. Look to see where the lens focuses its image, measure the magnification there, and locate H' by knowing that the distance from H' to the focused image is just (magnification+1)*f'. Notice that the infinity focus technique is just a version of the finite focus technique, using magnification=0 which is the limiting magnification as the object moves farther and farther away.